Dameian Duwe has been in the agriculture industry for over 22 years. Within those two decades he’s honed his knowledge and love for all things farming. He studies horticulture at Meramec community college, and has spent over eight years as a nurseryman, all while being an independent urban farmer. In 2012, Dameian started an urban farming project where he teaches individuals how to build urban farms in their own backyards. 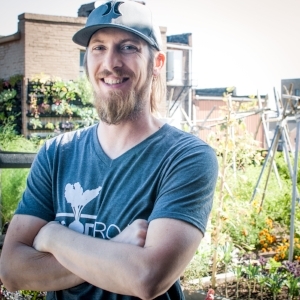 Growing up, urban farming was a way of life that was taught to him by his family. There was no other way. As he’s grown and continued to learn about this industry, Dameian has realized the countless benefits urban farming can bring to individuals and how it can help grow a community. He looks forward to sharing that knowledge and experience with others as Urban Harvest’s Lead Farmer.